I Heart Makeup Theme Palette: U R The Best Thing. So we are finally, (many months later than expected!) finishing the series of I Heart Makeup ‘Theme Palettes’ and I think we are ending with the best of it! The formula of these shadows is in keeping with the range and for more details on the formula I encourage you to read my range overview here. This post, however, is a dedicated swatchfest for the ‘U R the Best Thing’ palette. The matte selection in this palette is super practical with a tone range from cream highlight through to a very pigmented black. I love the taupe shades on offer in the third row. SO pretty on the eye. The final pink shade in the row 3 shimmers is really flakey and is difficult to work with, it is really a dud shade. The first six shades of the 4th row are very reminiscent of the Naked 3 palette – pink tones and very pretty. Overall, I think the colour selection in this palette is super practical and very everyday wearable. Of the three ‘Theme Palettes’ from this range this is the one I have gotten the most use out of. Admittedly these are mainly cooler tones but I think this is a very pretty shade selection and extremely travel friendly. So that brings this series to a close. Apologies that I have been MIA but I hope you have enjoyed the swatchfest and I look forward to posting more frequently. This entry was posted in I Heart Makeup, Makeup Revolution Reviews, TAM Beauty, Uncategorized and tagged budget friendly, cruelty free, Eyeshadow Palette, I Heart Makeup, Makeup Revoltuion, mattes, megansmakeupmuses, shimmers, TAM Beauty, Theme Palette, U R the Best Thing on November 4, 2017 by megansmakeupmuses. 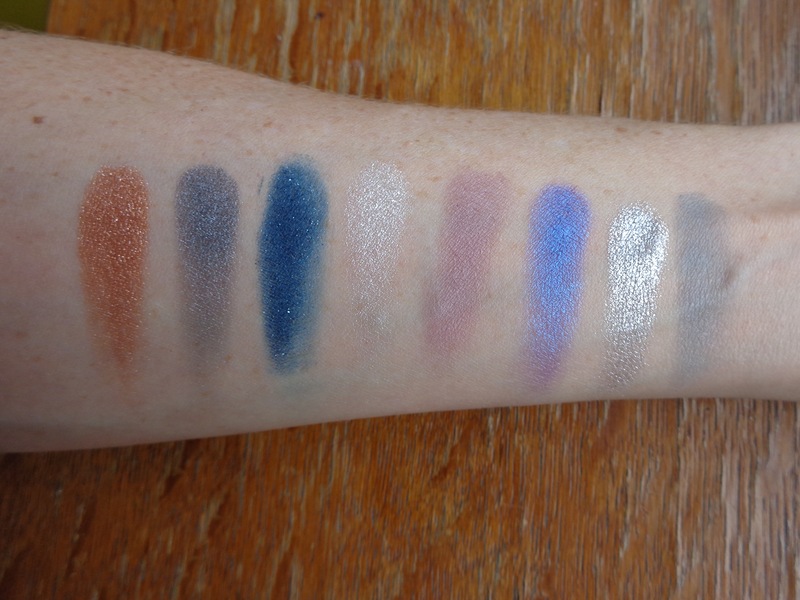 Here is the next swatch-fest post for the Theme palette range from I Heart Makeup, and this time we are looking at the ‘You’re Gorgeous’ palette. For a more general review of the Theme Palette range including the eyeshadow formula and packaging, see my blog post here. The ‘You’re Gorgeous’ palette is quite a cool-toned palette with lots of lovely taupe shades. This is certainly more of a neutral palette and great for everyday wear. The colour selection of matte shades in this palette are super practical with a nice range of crease shades and darker more dramatic shades as well as some interesting plum tones. I like the fact that these mattes allow for a very neutral, everyday look as well as facilitating a more dramatic smokey eye. The shimmer shades are much more consistent quality in this palette when compared to the ‘Fast Love’ palette. They are generally smooth and pigmented with none of the chunky, patchy, flakiness that was evident in a couple of the shades in the ‘Fast Love’ version. The peachy shimmer shade above, (swatch 2) lacks pigmentation but you can build it up if you foil it with a fixing spray. swatches: row three – last five shades. Row three of the shimmers really is beautiful. You have some bright, lighter shades, a pinky-taupe, a copper and all the chocolatey browns you could need. Perhaps a criticism would be that there are quite a few similarities among the browns here, but they are pretty. While row three feel really cohesive to me, row four has a few more interesting colours – not really “pops” of colour, but there is certainly more variety on offer here. The last two shades in the palette (swatch 4 and 5 above) are certainly the weakest shades in my opinion. The black and blue both contain silver glitter, which is not my jam to start with, but I find the matte base of these shadows to be quite dry and chalky. The blue, in particular, is patchy and hard to blend. I would recommend going in with a little at a time and building the colour slowly as it is pigmented and will stain the eyelid a bit. Also – who decided that this blue fitted with the rest of the colours in this palette when it was being curated. Random?? The black glitter shade isn’t as bad, but the glitter falls out as you blend so I think the matte black in row two is a better option and if you want glitter, add it separately afterwards. Overall, I like this palette. Lots of neutrals and the quality really is pretty good. This entry was posted in I Heart Makeup, Makeup Revolution Reviews, TAM Beauty, Uncategorized and tagged budget friendly, cruelty free, Eyeshadow Palette, I Heart Makeup, makeup revolution, matte eyeshadows, megansmakeupmuses, shimmer eyeshadows, swatches, TAM Beauty, Theme Palette, You're Gorgeous on August 26, 2017 by megansmakeupmuses. This post is going to be a bit of a swatch fest as well as being a specific review of the Fast Love palette shades but if you would like a review of the range in general (ie. shadow formula, packaging etc) you can find my blog post here. Straight up I am going to say that of the three palettes in the Themed Palettes range, this is my least favourite. This has nothing to do with the formula of this palette compared to the other two, but rather the colour selection. In terms of the overall feel of the palette it feels more cool toned to me and has lots of pops of colour. Part of the reason that I don’t enjoy this palette as much as the other two is that I think it is arranged in a really haphazard way that isn’t user friendly. I am sure that these colours can come together quite easily to make pretty looks but the colours, as they are arranged, don’t really inspire me. In terms of the matte shades there are a couple of really good transition shades here for me as well as a darker brown for darkening up with crease. I don’t love the purple and blue mattes as they aren’t my thing, but they are certainly nicely pigmented. The lighter cream shades are surprisingly pigmented although the first cream is the same colour as my skin so hasn’t swatched well in the image above. If you have a darker skin tone you may find that there is not enough darker mattes provided here for you to get a dynamic look. The satin and shimmer shades are a little bit hit and miss in the Fast Love palette. Out of the whole palette the weakest shade in my opinion is the silver shimmer shade (swatch 3 below). This is fallout central! It is patchy and flakey and makes a mess. The glitter shades are my least favourite as I really don’t like glitter shades in general. I don’t think the glitter transfers that well to the eye and will fall out when you blend so I typically avoid these. Luckily there aren’t many glitter shadows in this palette. After that little bit of negativity, as you can see above, the last three shimmer shades in the third row are really beautiful. Metallic, pigmented and buttery. The satin pink shade (last swatch above) really lacks pigmentation which is such a pity. Even when applied with some fixing medium it isn’t very impressive which is a bummer. In contrast that purple shade in the bottom row (swatch 3 above) is SUPER pigmented and very pretty. 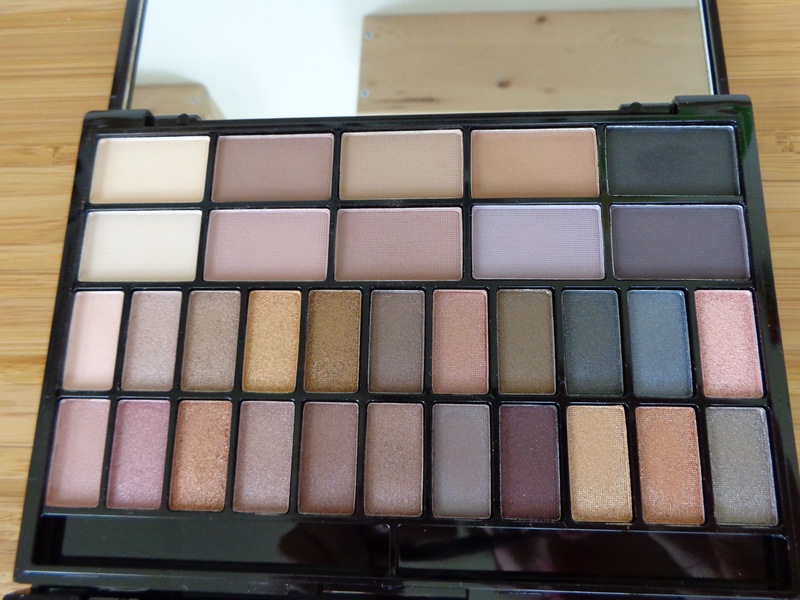 Finally, the last six shades in the bottom row are my favourite from the palette. They are rich and chocolatey and much more to my taste colour wise. The third pink colour (see swatches above) is again, a bit flakey and chunky, but it is workable. Overall, for the price this is a good palette, particularly if you are interested in adding some jewel toned shadows to your collection on a budget. Out of the three palettes in the range this is my least favourite BUT there are still a lot of lovely shadows to be had here. This entry was posted in I Heart Makeup, Makeup Revolution Reviews, TAM Beauty, Uncategorized and tagged budget friendly, cruelty free, eyeshadow, Eyeshadow Palette, Fast Love, Fastlove, I Heart Makeup, Makeup Revoltuion, matte eyeshadow, megansmakeupmuses, shimmer eyeshadow, TAM Beauty, Theme Palette on August 23, 2017 by megansmakeupmuses. There are three palettes in the I Heart Makeup – Theme Palette range. I am going to conduct a swatch-fest of all three in detail over the next couple of weeks because they have not really received much love online despite being in the TAM beauty range for a long time. This post will be an overall review of the range and the shadow formula. The palette packaging is identical across the range of theme palettes: a shiny black plastic that is quite sturdy and bright pink lettering that is reflective. Simple but classy. The cardboard packaging that it comes in isn’t quite as classy, but the whole I Heart Makeup range is more aimed at a younger audience so it certainly fits with that aesthetic. These palettes contain 10 matte shadows and 22 shimmer/satin/glitter shades all contained in quite a compact palette with a huge mirror included. The matte shadows are larger than the shimmer shades which I appreciate for two reasons. You don’t really need as broad of a selection of colours of mattes in my opinion and also, you are going to likely use a bigger, fluffier brush in the matte pans and the larger size accommodates this well. In terms of the formula the matte shades are very soft and finely milled to the touch but they do kick up a lot of product when you dip into them and you really do need to tap off your brush. They blend really well though. The shimmer pans are small so depending on your brush size this may ban an issue but an E.L.F. flat shader brush fits in just fine. The shimmer formula in particular is quite thick and almost wet feeling and this mineral oil content does make them a little tricky to pick up with the brush at times but they apply really well when foiled with a fixing spray or when patted onto the lid with your finger. The shades wear quite well. I find that the shimmery shades do fade a bit throughout the day. I have combatted this by using a cream shadow (e.g. a ColourPop Super Shock Shadow) as a base and then these will wear all day on my lids. These palettes retail for about AU$15 which is an amazing price for this palette. Overall, if you are looking for a really practical palette with a good range of shades including a pop of colour, then I think this is a great purchase. This would be a particularly useful palette for a makeup beginner or someone looking to build their eyeshadow collection. This entry was posted in I Heart Makeup, Makeup Revolution Reviews, TAM Beauty, Uncategorized and tagged budget friendly, cruelty free, Eyeshadow Palette, Fast Love, I Heart Makeup, Makeup Revoltuion, matte eyeshadows, megansmakeupmuses, shimmer eyeshadows, TAM Beauty, Theme Palette, U R the Best Thing, You're Gorgeous on August 20, 2017 by megansmakeupmuses. Of all the products that Makeup Revolution sell I love their eyeshadows the best. Brace yourselves for a LOT of palette reviews to come but I have decided to start with the Makeup Revolution: I Heart Makeup – Theme Palettes because of all the palettes on their website, these are the palettes that I really couldn’t find many reviews for. There are three I Heart Makeup – Theme Palettes in the range and each palette includes 32 shades including 22 shimmer eyeshadows and 10 Matte eyeshadows. The palettes are compact with glossy, solid packaging, a huge mirror and bright pink labelling. As you can see they are so reflective that this picture shows you everything hanging on the wall behind! 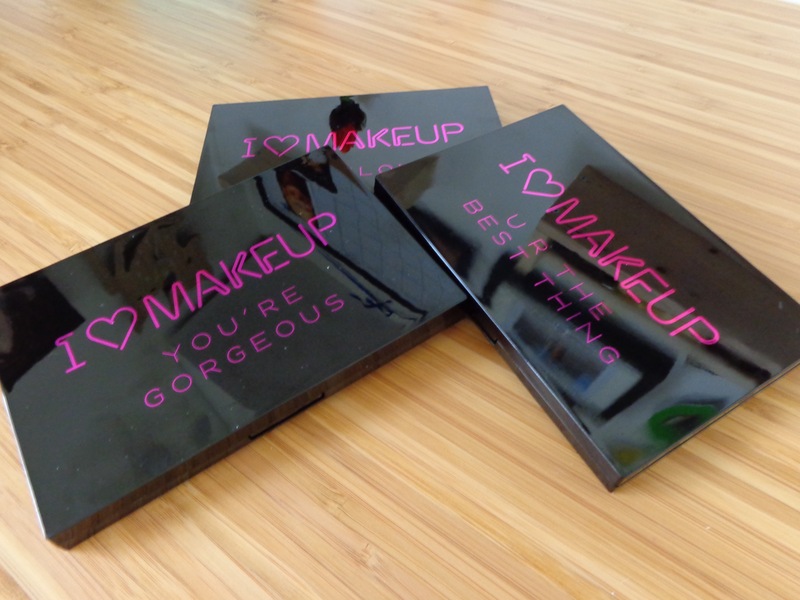 Makeup Revolution: I Heart Makeup – Theme Palettes from left to right U R the Best Thing, You’re Gorgeous, Fast Love. Across the palettes there is a great range of colours with a really excellent balance of mattes and shimmers which I think is super practical. ‘U R the Best Thing’ includes lots of rosy toned colours as well as some mauves and golds. This is a very feminine palette reminiscent of the Naked 3. ‘You’re Gorgeous’ is more of a neutral palette with a lovely selection of browns, bronzes, taupes and mauves. There is also a really unusual royal blue colour with silver sparkle (bottom row, far right) that is extremely pigmented and a fun touch of colour. Lastly is ‘Fast Love’ which is more of a colourful palette with a mix of pastels and more smokey colours as well as some more neutral shades. I imagine that this mix of colours would make this a good palette to travel with because you could easily get pretty, neutral day looks as well as much more dramatic night looks with this one palette. 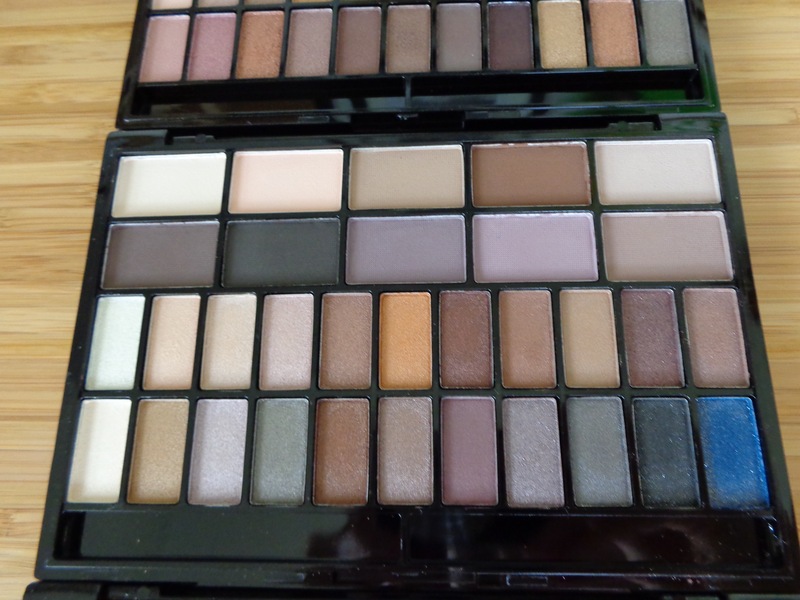 Overall I really like the I Heart Makeup – Theme palettes. All the eyeshadows are really pigmented, buttery and blend well. 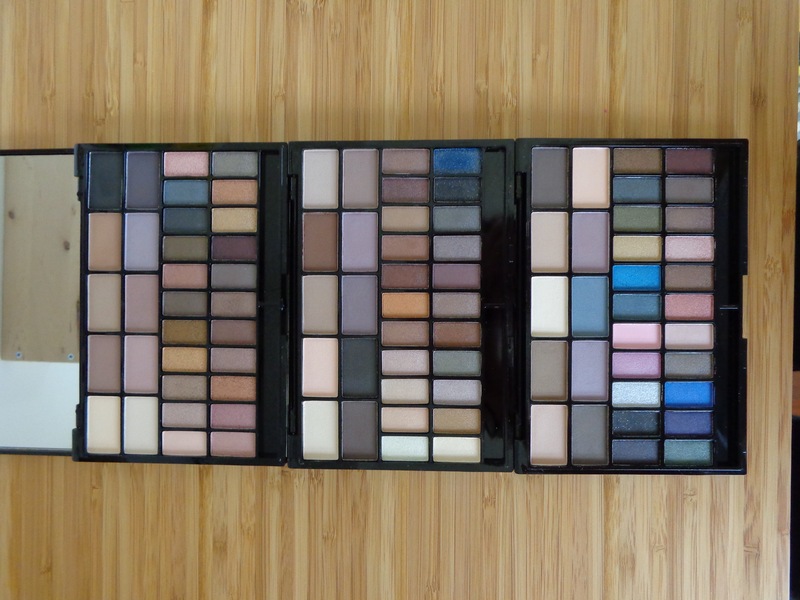 I have found these very easy to work with and across these three palettes I have every colour I would ever need. I expect that these palettes were designed to target a younger age-group of makeup wearers, but I have enjoyed these palettes regardless! 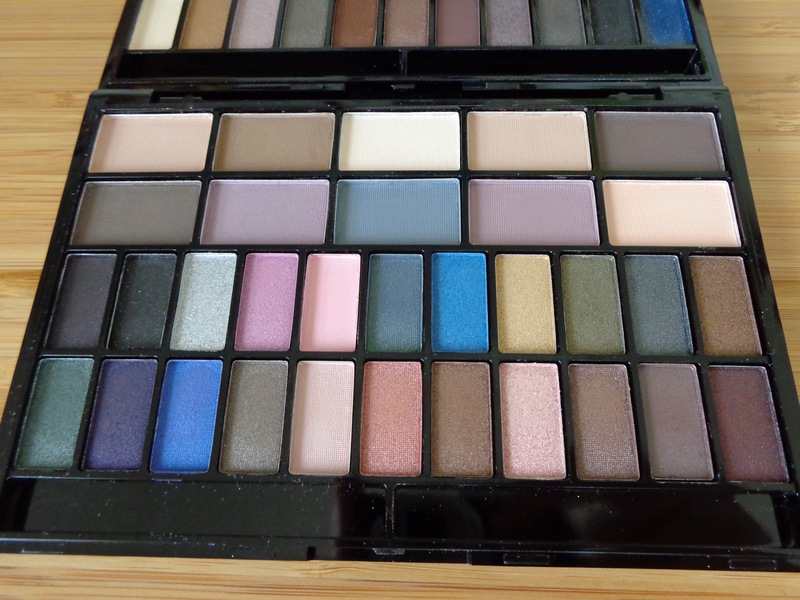 I Heart Makeup: Theme Palette – selection of swatches from all three palettes including shimmers and mattes. This entry was posted in Makeup Revolution Reviews and tagged budget friendly makeup, cruelty free, Fast Love, I Heart Makeup, makeup revolution, megansmakeupmuses, Theme Palette, U R the Best Thing, You're Gorgeous on June 8, 2015 by megansmakeupmuses.